An excellent work that must be cherished, preserved and have a permanent place on your digital bookshelf. The awakened conscience of the sixteenth century betook itself to “the righteousness of God” (Rom 1:17). There it found refuge at once from condemnation and from impurity. Only by “righteousness” could it be pacified; and nothing less than that which is divine could meet the case. 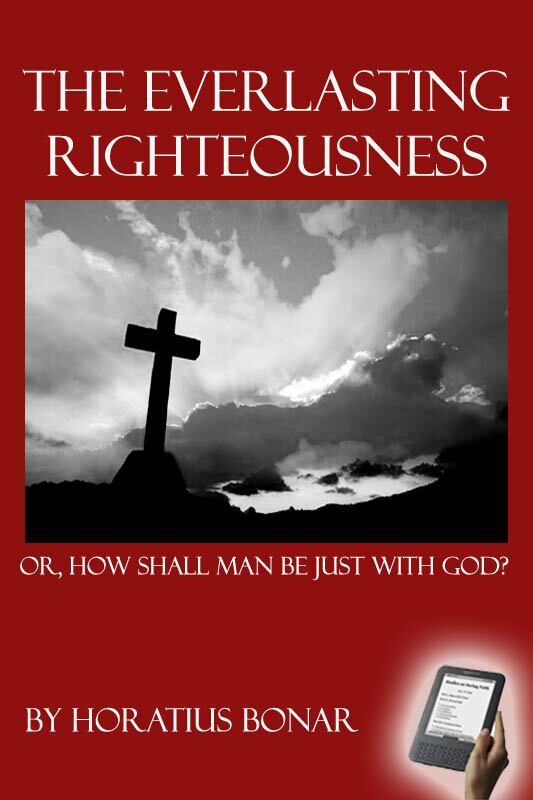 At the cross this “righteousness” was found—human yet divine, provided for man, and presented to him by God for relief of conscience and justification of life. On the one word, τετέλεσται, “It is finished” (Joh 19:30), as on a heavenly resting-place, weary souls sat down and were refreshed. The voice from the tree did not summon them to do, but to be satisfied with what was done. Millions of bruised consciences there found healing and peace. The belief of that finished work brought the sinner into favour with God, nor did it leave him in uncertainty as to this. The justifying work of Calvary was God’s way not only of bringing pardon, but of securing certainty. It was the only perfect thing that had ever been presented to God in man’s behalf; and so peculiar was this perfection, that it might be used by man in his transactions with God, as if it were his own. The knowledge of this sure justification was life from the dead to multitudes. All over Europe, from the Apennines to the Grampians, from the Pyrenees to the Carpathians, went the glad tidings that man is justified freely, and that God wishes him to know he is justified. It was not merely a new thought for man’s intellect, but a new discovery for his soul: 1) as to the true source of spiritual health, namely, the setting of man’s conscience right with God; 2) as to the continuation of that health, namely, the keeping of the conscience right. The fruit of this was not merely a healthy personal religion, but a renovated intellect and a noble literature, and, above all, a pure worship. It was an era of resurrection. The graves were opened, and the congregation of the dead became the Church of the living. Christendom awoke and arose. The resurrection-dew fell far and wide; nor has it yet ceased to fall. For ages Christianity had groveled in the dust, smothered with semi-pagan rites; ready to die, if not already dead; bound hand and foot by a semi-idolatrous priesthood, unable to do aught for a world that it had been sent to regenerate. Now “it was lifted up from the earth, and made to stand upon its feet as a man, and a man’s heart was given to it” (Dan 7:4). A new conscience was born, and with a new conscience came in new life and power. Nothing had been seen like this since the age of the apostles. The doctrine of Another’s righteousness reckoned to us for justification before God is one of the links that knot together the first and the sixteenth centuries, the Apostles and the Reformers. The creeds of the Reformation overleap fifteen centuries, and land us at once in the Epistle to the Romans. Judicial and moral cleansing was what man needed; and in that epistle we have both the imputed and imparted righteousness, the former the root or foundation of the latter. Not the one without the other—both together, inseparable; but each in its own order. It was not Luther (1483-1586) merely who took up the old watchword, “The just shall live by faith” (Rom 1:17), and thus found the answer of a good conscience toward God. To thousands of hearts it came like a voice from heaven, they knew not how. Sunshine from above had fallen upon one grand text, the text that the age needed; men recognised the truth thus supernaturally lighted up. “The nations came to its light, and kings to the brightness of its rising.” The inquiring men of that age, though not borrowing from each other, betook themselves to this truth and text. From every kingdom of Europe came the same voice, and every Protestant Confession bore witness to the unanimity of awakened Christendom. The long-needed, long-missing truth had been found; and ε͑͑ύρηκα was the cry of gladness heard announcing its discovery. Religion is fashionable in our age. But is it that which sprang up after centuries of darkness among our fathers in Europe? Is it that of apostles and prophets? Is it the calm yet thorough religion that did such great deeds in other days? Has it gone deep into the conscience? Has it filled the heart? Has it pervaded the man? Or has it left the conscience unpacified, the heart unfilled, the man unchanged, save with some external appliances of religiousness, which leaves him hollow as before? There is at this moment many an aching spirit, bitterly conscious of this hollowness. The doctrine, the profession, the good report of others, the bustle of work, will not fill the soul. God Himself must be there, with His covering righteousness, His cleansing blood, His quickening Spirit. Without this, religion is but a shell; holy services are dull and irksome. Joy in God, which is the soul and essence of worship, is unknown. Sacraments, prayer-meetings, religious services, labours of charity, will not make up for the living God! How much of unreality there may be in the religious life of our age, it is for each individual to determine for himself, that he may not be deceived nor lose his reward. All unreality is weakness as well as irksomeness; and the sooner that we are stripped of unreality the better, both for peace and for usefulness. Men with their feet firmly set on Luther’s rock, “the righteousness of God,” filled with the Spirit, and pervaded with the peace of God, do the great things in the Church; others do the little. The men of robust spiritual health are they who, like Luther, have made sure of their filial relationship to God. They shrink from no battle nor succumb to any toil. The men who go to work with an unascertained relationship give way in the warfare, and faint under the labour. Their life is not perhaps a failure or defeat—but it is not a victory; it is not a triumph. “We do not war after the flesh,” and “our weapons are not carnal” (2Co 10:3-4). Our battle is not fought in the way that the old man would have us to fight it. It is “the fight of faith” (1Ti 6:12). It is not by doubting but by believing that we are saved; it is not by doubting but by believing that we overcome. Faith leads us first of all to Abel’s “more excellent sacrifice” (Heb 11:4). By faith we quit Ur and Egypt and Babylon, setting our face to the eternal city (vs. 16). By faith we offer up our Isaacs and worship, leaning on the top of our staffs, and give commandment concerning our bones (vv. 21-22). By faith we choose affliction with the people of God, and despise Egypt’s treasures. By faith we keep our passover; pass through the Red Sea; overthrow Jerichos; subdue kingdoms; work righteousness; stop the mouths of lions; quench the violence of fire; turn to flight the armies of the aliens; and refuse deliverance in the day of trial—that we may obtain a better resurrection (vv. 28-30, 33-35). It is “believing” from first to last. We begin, we go on, we end in faith. The faith that justifies is the faith that overcomes (1Jo 5:4). By faith we obtain the “good report” (Heb 11:39), both with God and man. By faith we receive forgiveness; by faith we live; by faith we work, and endure, and suffer. By faith we win the crown—a crown of righteousness, which shall be ours in the day of the appearing of Him Who is our Righteousness (1Co 1:30).